When it comes to investing, lots of millennials are hesitant. One of the biggest excuses is not being able to afford to invest but clearly, that’s a myth. It doesn’t take much to start investing and given the fact that more Americans own cats than stocks (according to a Bankrate survey), I’m led to believe that with a careful and specific spending plan, most people will be able to afford to invest. So what’s the hold up then? Fear is another big obstacle people need to overcome in order to start investing. There are a lot of myths out there that scare people away from investing. Some people say investing is just like gambling which isn’t true. Others are afraid they’ll lose all their money in the stock market and it’s no secret that there is some risk when you invest. On the other hand, by putting off investing, you could be doing yourself a huge disservice financially. Investing is one of the best ways to build wealth and get your money to work for you. When you procrastinate out of fear, you waste precious time that could have been spent saving. Here are 4 ways to get over your fear of investing. You don’t want to have fear of the unknown so take the time to understand how the market works. Don’t just take someone’s word for it, read up on investing and do your research. There are reports on how the market has done that date back as far as 100 years. While it does rise and fall, you can see from the data that consistently, the market always recovers and improves itself. Recently, the market took a noticeable nosedive which didn’t sit well with many people. I know some people who report losing thousands of dollars on that day alone. It’s kind of scary, I get it. But, it’s to be expected. If you educate yourself about the market, you’ll know that it dips all the time and eventually recovers. When you freak out and sell at the low points, you’ll lose money when it would be better to stay calm and run the course especially if you’re in it for the long run. Investing is only a scary risk when you go into it blindly so learn all you can so you can make wise and rational decisions while you build wealth. Putting all your eggs in one basket is almost never a good idea, especially when it comes to investing. The safest way to invest is to diversify your assets and be smart about it. For some, this means using different retirement accounts like a 401(k) and a Roth IRA for example. If you’re going to invest in index funds, make sure you use a combination of stocks and bonds. A portfolio made up heavily of stocks will always be riskier but if you add in some bonds that could offset things and make it more balanced. Also, who said you only had to invest in the stock market to build wealth? You can also consider investing by other means like with peer-to-peer lending or real estate. First, build up your emergency savings and contribute consistently to retirement accounts. Then you can add other types of investing to the mix but be sure not to make it extremely complicated. There is a downside to trying every option under the sun as well. But for example, having a few rental properties will make you feel more relaxed when the stock market does dip occasionally because your entire financial future isn’t being based on your stock investments. Instead of being afraid of what could happen if you start investing, think about what could happen if you don’t start investing and build a nest egg for yourself. Investing is the key to building long-term wealth because compound interest helps make your money work for you instead of you working hard to earn money each month. Think about when you want to retire and how crucial a role investing can play in that process. Realize that relying on a miracle or social security income for that matter just won’t cut it. Social security helps keep 1/3 of retired Americans out of poverty, but it probably won’t provide you with enough to live a comfortable life. Also, you have to consider the idea of you possibly not wanting to work or not being able to work before traditional retirement age. Investing can help provide you with a realistic escape route from the rat race. 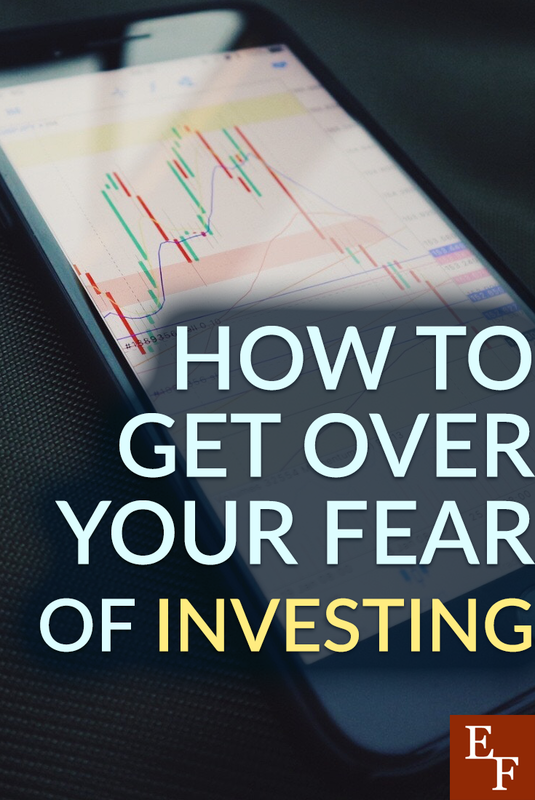 Finally, to get over your fear of investing, you just need to start. This is not to say you should jump in blindly, but start small and with a low risk. You can seriously start investing with as little as $5 with Stockpile. Investing this small amount of money won’t help you retire, but it will help you get more comfortable with the idea of investing and truly see how compound interest works first hand. When I first started investing, I could only afford to save $100 per month but I saw it as money I was putting toward financial independence in the future. It felt great to watch my portfolio grow and even despite the recent market dip, I still have more in my account than I actually saved. Getting an average return of anywhere from 4% – 12% is nice and won’t happen with your average savings account so putting your fears aside and getting started with investing is worth a try. Have you ever had any of these fears when it came to investing? How did you overcome your fear of investing? Are Bonds at Risk of Default?